You are here: Home / Attend our Spring Open House! Wed., May 1 at 6:00-8:00 p.m. 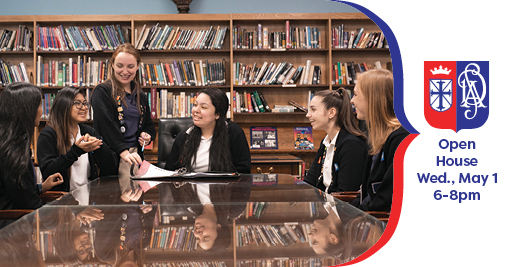 This event offers the perfect opportunity to learn about Saint Dominic Academy and our 140-year tradition of empowering young women for leadership in a global society. AP courses, plus the opportunity to earn college credits before you graduate high school! This Open House also feature club and athletic demonstrations, including a performance by the award-winning Dominoes, presentations by academic departments and administration, tours of the school and information about the application process for grades 7-12, including transfers. For further information, contact Director of Admissions Andrea Apruzzese at (201) 434-5938, ext. 14. Register for our Spring Open House!